Stresses that occur within the material itself, i.e. without the influence of any external force. Differentiation is made between internal stresses of the first, second, and third kind (Fig. 1). 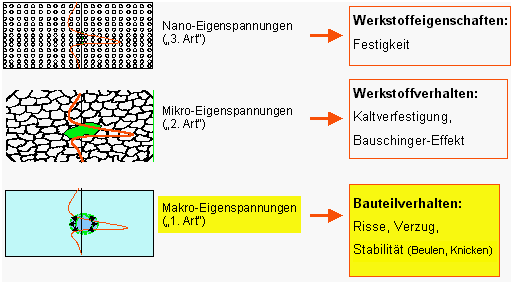 Stresses that occur subsequent to heat treatment during the cooling phase or through uneven reforming are referred to as internal stresses of the first kind (internal macro-sresses). Internal stresses of the second kind are found in the strain area between unevenly oriented grains and phases of equal strength (homogenous internal micro-stresses). Internal stresses of the third kind are stresses that occur in the areas around lattice defects (inhomogenous internal micro-stresses). Internal stresses in general cause anisotropy.